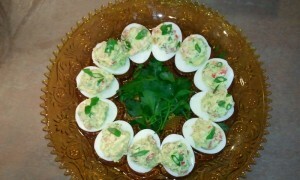 Using wild caught salmon in these deviled eggs turns them into a meal! Place eggs in a pot large enough to hold them in a single layer and add cold water to cover plus about 1 inch. Place pot on high heat and bring to rolling boil. As soon as water boils, turn the heat off and leave the eggs for 12 minutes exactly. Drain hot water and run cold water over eggs until cool enough to handle. Peel all the eggs then cut in half lengthwise. Put the yolks in the bowl with all the other ingredients including the salmon and mix. Taste and adjust seasonings. Scoop the filling back into the egg white halves, sprinkle with the green onion and enjoy! This entry was written by Terese, posted on February 14, 2012 at 10:04 am, filed under Blog, Paleo Friendly, Recipes, Wild Caught Salmon, Wild Caught Seafood and tagged save money on wild caught seafood, wild caught salmon, wild caught salmon Arizona, wild caught salmon for Paleo diet, wild caught salmon Las Vegas, wild caught salmon Los Angeles, wild caught salmon New Mexico, wild caught salmon Salt Lake City, wild caught salmon San Diego, wild caught seafood. Bookmark the permalink. Follow any comments here with the RSS feed for this post. Both comments and trackbacks are currently closed.